Silver is an element found in use in so many of today’s daily gadgets. All of that metal has to come from somewhere to feed the high demand. Silver mining is done to extract silver and either market it in its purest form or combine it with other metals to form alloys, as in sterling silver for jewelry. As silver is constantly being mined to keep up with the need of today’s society, it can be a lucrative investment to make. Owning stock in a silver mining company means that you own shares of a company that mines silver. Unlike other paper silver investments, mining stocks are unique. Your shares are highly dependent on the spot price of silver, and if you own a large amount of shares in a time when the price of silver is rising, the value of your stocks can really be amplified. However, this can also go the other way. 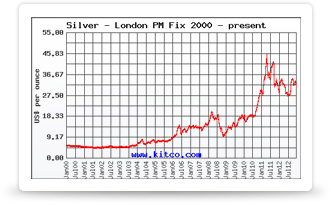 A fall in the price of silver can reduce the value of your shares dramatically. The current price of silver is not the only factor that determines how your portfolio performs. Other factors are also pertinent. These include management of the mining company itself. Your return depends on how the mining business is operated. Factors completely unrelated to the actual market price of silver metal itself can still negatively impact you all the same. Take for example human factors. If there is a worker’s strike or poor and inefficient management, the company will have reduced productivity. You, as a shareholder of stock in that mining company, will see a reduced share price in your stock. Logically, if less silver is being mined, it becomes even more of a valuable commodity and the price of silver will increase. However, since your stock is directly tied to a company that is not performing well, you will see a fall in share price. Even though these factors are completely out of your control, you are still affected. Owning silver mining stock can be just as unpredictable and volatile as other paper investment types. While silver mining stock does have the ability to perform well, it does not necessarily mean it correlates directly with the silver market. One thing to keep in mind when considering your silver mining stocks is that often silver is alloyed with other metals. So to have a good idea of how your portfolio is performing, you may need to track the price of those other metals as well. If the price of other metals alloyed with your silver is falling, it may be enough to negate the rising price of silver and ultimately come as a loss to you. How to choose a mining company to invest with depends on how much silver you would like to invest and your ultimate goals for your shares. Obviously, you would like to make money, but decide if you would like long term stability or more short term leverage. When shopping around, look into how much of the mine’s silver production has been hedged. Unhedged silver is leveraged well and will perform better if the price of silver rises. If the price of silver falls, however, your unhedged investment is riskier. If the price of silver falls and you’ve invested in a company with substantial hedged silver, your shares are better protected. It is recommended that you invest the majority of your silver in another method and use mining stocks as a supplement.